I didn’t really experience the effects of caffeine until after my son was born. I just sort of coincidentally preferred drinks that didn’t have caffeine in them. I didn’t like the taste of coffee and if I had a soda I always choose Sprite or root beer. Then my son was born and I was suddenly having to cope with getting only 2 or 3 hours of sleep on some nights. Hmm… maybe I should try these “energy drinks” people keep talking about. My world was transformed. 2. Does this mark the first time we’ve seen Biff’s eyes? 3. Ahahahahahahahahhhh. This might be the best comic ever! This may very well be the scariest thing I’ve ever seen. Biff with eyeballs just doesn’t look right at all. Oh dear god in heaven never let Biff look at me like that again. Cue nightmares. I believe this falls under what tvtropes terms as “Accidental Nightmare Fuel”. No no, this falls under “High Octane Nightmare Fuel” as there was nothing accidental about it. Yeah, I figured that was the first time seeing his eyes, too. May have to go searching for the previous one based on Chris’s answer. You must read them ALL again! Hahahahahahahahahaha! Did anyone else check to make sure they hadn’t time-traveled to April 1st? 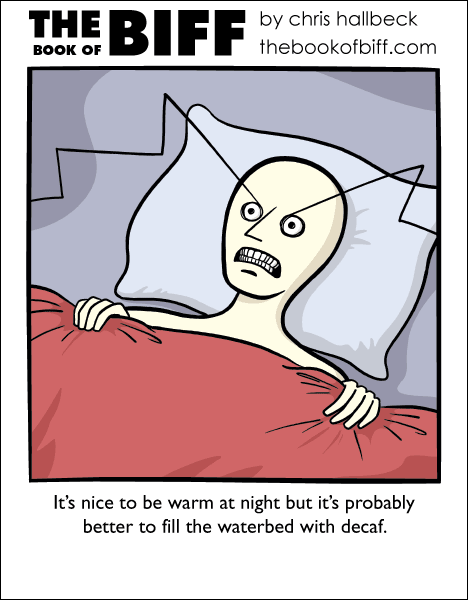 The creepiest thing about this comic? I’ve seen that face in real life… In the mirror. When you’re not looking at the panel, it looks at you! I cried in fear like a little kid. Doesn’t…doesn’t anyone else remember when biff had eyes? Once was during the fork-in-power socket, and I think another was in an April Fools day comic. …. I have just discovered one of the few things in existence that scares me. It’s not the first time we’ve seen Biff’s eyes or teeth, but with this combination of eyes, teeth, and no dismemberment, this may be the most ‘human’ Biff has ever looked (not counting guest comics).